This entry was posted on November 11, 2013 by Rick. Baofeng handheld two way radios are well known among amateur radio operators everywhere. Models such as the UV-3R, UV-B6, BF-F9 and the legendary UV-5R are a common staple in the modern ham shack, and with good reason. 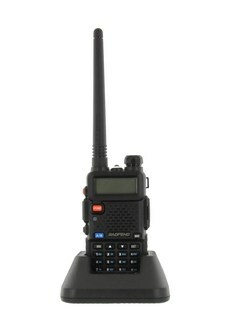 These radios are compact, easy to use, versatile and, best of all, extremely inexpensive. They are some of the most affordable amateur radios on the market. These attributes have made Baofeng a household name in the ham community. However, programming a Baofeng radio from a computer isn't all that intuitive and can become messy even for the most experienced ham who is not used to Chinese-made radios. The USB cable driver offered by Baofeng is buggy and the programming software made by the manufacturer is, for all intents and purposes, junk. Fortunately, there are other options available, and once properly installed, they are actually quite good. You just need to know where to find these options and how to install them properly. Once that is accomplished, programming is usually a breeze. To find and install the Baofeng USB Programming Cable driver and programming software correctly, follow the instructions below. NOTE: follow these instructions completely and in order. Failure to do so may only bring more frustration when things don't work. 1. To start, the computer should be on and the radio should be off. 2. Locate the correct USB programming driver for your operating system. You can download the Prolific driver for Windows, Mac and Linux at http://www.miklor.com/COM/UV_Drivers.php. If you purchased the Baofeng UV Series USB Programming Cable from Buy Two Way Radios, the driver for Windows will be on the CD included with the cable in the USB Cable Driver folder. Insert the CD and go to USB Cable Driver > USB Cable Driver Prolific 3.2.0.0.exe. This is the correct driver. 3. Install the USB programming cable driver. Do NOT connect the USB cable at this time. 4. Locate the CHIRP Programming Software for your operating system. The latest stable build for Windows XP, 7, 8, MAC and Linux can be downloaded from http://chirp.danplanet.com/projects/chirp/wiki/Download. It is also included on the Buy Two Way Radios CD in the CHIRP Programming Software folder. Choose the appropriate folder for your operating system. Install the program but do not run it yet. 5. Plug the USB programming cable into the USB port on your computer. Plug the other end of the cable into your radio and turn it on. - There may or may not be a notification after connection. To verify the connection, check the Windows Device Manager. Access to the Device Manager will depend on your version of Windows. Once in Device Manager, click on Ports (COM and LPT). It should be listed as Prolific USB-to-Serial Comm Port (COMX). X denotes the COM port number. Note the number and write it down if necessary, as you will need to know it when configuring the programming software. - If there is a yellow triangle with an exclamation mark next to the USB device, Windows did not install the driver correctly. To correct the issue, right-click on the device and choose Update Driver Software on the pop-up menu. Choose Browse My Computer to install the driver manually. Choose Let me pick from a list of device drivers on my computer. Choose Prolific USB-to-Serial Comm Port Version: 3.2.0.0 and click NEXT. The correct driver should install and the yellow notification should disappear from the Device Manager. Note the COM Port number. 6. Run the CHIRP Programming Software. Click Go to Radio on the menu bar and choose Download From Radio. Choose the COM Port number for the USB cable, the Vendor (Baofeng) and the model of the radio (such as UV-5R) from the drop down lists in the pop-up box. Your radio should be connected to the computer and CHIRP should now be able to communicate with it. On some laptops, the device manager may indicate the cable is installed correctly, but CHIRP may not detect the COM Port. This may occur if Windows Power Management is enabled on the device. To activate the cable, go to the Device Manager and right click on Prolific USB-to-Serial Comm Port (COMX). X denotes the COM port number. Click Properties on the pop-up menu. Click the Power Management tab. Remove the check from the box next to Allow the computer to turn off this device to save power and click Apply or Save. To verify the connection, Run the CHIRP Programming Software. Click Go to Radio on the menu bar and choose Download From Radio. Choose the COM Port number for the USB cable, the Vendor (Baofeng) and the model of the radio (such as the UV-5R) from the drop down lists in the pop-up box. The program should download the frequencies from the radio. When it completes the data transfer, the frequency table will appear on the screen. The radio is now ready to program through your computer. As an authorized Baofeng Dealer, we want installation to be as easy and painless as possible so you can enjoy your radios for many years to come. If these instructions are followed correctly, you should not have any difficulty connecting the Baofeng radio to your computer. After the initial setup, future connection to the computer should be a matter of simply plugging the USB programming cable into your radio and computer and running CHIRP. Note: If you followed the installation instructions and are still having trouble, there is now another solution available. The XLT Painless Programming Cable installs quickly and easily on computers with Windows XP, Windows 7 and Windows 8. Installation is automatic on many systems with little or no user interaction required. The XLT Painless Programming Cable works with Baofeng, Kenwood, Wouxun and other two way radios equipped with standard two pin Kenwood connectors. Update: Hear our review of the Baofeng UV-5R Programming Cable in Episode #82 of The Two Way Radio Show Podcast! I have a UV 9R Plus Digital Mobile Radio ..I unscrewed the screw on the right side to attach an external mic .however there are no holes to slide the connection into only a hole where the screw goes and flat rectangular pieces of copper stripping as tho some thing else to needs to connect to it first .I can find no info about this ..any clues ? I am trying to transfer all frequencies from a Wouxun KG-UVD1P to a Baofeng UV5R. I am doing it on A Windows 7 laptop, using Chirp and Prolific Driver 3.2.0.0. I can download both radios with no problem , but unable to upload because the upload section is "grayed out" and you cannot change the radio from Wouxun to Baofeng. Any help would be appreciated. John, from what you describe, it sounds like you are attempting to upload the frequencies by switching to the other radio after downloading it from the first one. CHIRP doesn't operate that way. Please read the section Transferring data between radios on the Frequently Asked Questions page of the CHIRP wiki on their web site for instructions on properly moving frequencies from one radio to another. It sounds easy. but when I dump the FTDI usb driver and load the Prolific, the computer says the FDTI is there. I can read the radio fine, I can write a 2-line frequency file and it says it writes, but there is no program in the radio and turning it on gives a loud squeel in every channel selected. I can write the default program that came out of the radio back to it ok though. BUT, if I change a line, save it and write it back the ORIGINAL line is there. I have been frustrated for over 4 weeks trying to hook up my Boefang UV-5r and my wouxun kg-uv8d and finally got everything working with your help. I've been attempting to set up my UV-5R for over a month, talking back and fourth with the seller. This post really helped out!!! Thank you for posting this step by step guide. UV5R user when using the chirp software for programming after you have down loaded the software to your computer, make sure your wifi on your computer is turned off during your radio programming, remember to turn your wifi back on when finished. Thank you so much for this write up! Works on my Windows 10 build. THANK YOU THANK YOU THANK YOU!!!! I am trying to program my Baofeng BF-888S radios. I have an FTDI chip cord and have downloaded the newest version of CHIRP and am still struggling. I have followed all directions on various pages and am still have two issues. 1. I can't properly download the prolific 3.2.0.0. driver. I follow the link online, install it, but nothing happens after installation besides being able to uninstall. When it does download and install via wizard, it says "Vista driver installer", making me think i have to do another step and am just being stupid. My second and main problem is every time I go tot the radio tab on CHIRP and try to download my radio, nothing happens. My usb-serial cable is plugged in, radio on, and nothing. I'm at a loss for what to do. Any suggestions or help would be so appreciated. I got a uv-82c and when I open the softwjere and do read data from radio it only reads to various points and then reads fail connect with transceiver. Help? I purchased the UV5 R Plus . It programs manually but no luck having the Radio commmicate with CHIRP or Baofeng Software. I've followed all suggestions. Have a FTDI cable. Exchanged it for one known to work. It's working on Com 6. Checked the USB and it has power. The port shows in the software , Com 6 etc., no errors or conflicts. There is absolutely no response from the Radio. The Error Message : ' Failed to Communicate'. Comes up after a brief attempt to download from Radio. I received a new replacement yesterday but same thing! It's not the cable. It's happening on both radios. My THD 74 communicates with this same Laptop. I updated the firmware and there were no problems. It's not the Laptop. Any suggestions? For a 28 dollar radio, I spent 20 for a non counterfeit cable FTDI Driver. I now must send thd other back, more costs. The hole is getting deeper and deeper. Suppose this new Radio could have the same problem. The firmware , BFB 297 on both. It's not the 600 dollar plus Kenwood 74 A but for 27 dollars , works well manually programmed. Don't know why I'm even messing with it. I still have a lot to learn and program on the Kenwood THD 74a. Any suggestions? Thank you so much for this article. I have been frustrated for over 2 weeks trying to hook up my Boefang UV-5r and my wouxun kg-uv8d and finally got everything working with your help. I so appreciate it. They told me I had to buy a new cable and this got my old black cable working for both. Just been upgrading the memory scan channels in my uv-5ra adding some new (strange and naughty for the uk) frequencies being used as cb type radios in my area (22 handheld radios and users so far) I am using the origional suplied software that came with my cable a few years ago, this software worked fine on an old xp pro laptop I had then but now on a windows 7 ultimate lappy and when I came to save the new file it comes back with "the file name is nullity" and wont let me type a file name in the box ? even when installed to run in xp compatability mode, still reads and writes fine but just wont save, anybody else had this? Have been struggling with the software on this for days, a favor for my old man who is a 85 yr old HAM Operator. The prongs weren't fully seated. Everything works. Feel like I've been told, "Is the power on?". HAHA thank you so much! I just grabbed one of these little radios off of Amazon and purchased the cable as well. It was distributed by Amazon but from vendor "Generic". Windows 10 automagically had the driver and the device shows up as "USB-SERIAL CH340". I used the cable successfully on my desktop PC via the powered hub built into my monitor as well as a HP laptop running Windows 7. When I tried to use my little Asus mini laptop I ran into a multitude of errors when trying to read. I had odd errors with it failing half way through a read at random blocks as well as "unknown" errors and several other odd ones when trying to read with Chirp. I was able to remedy this by using a powered USB hub. In short, the generic cable works fine on Windows 7 and 10 with the drivers available from Windows Update and if you have random errors try using a powered USB hub as the device seems to be power hungry. It will probably prompt you to install .Net Framework 3.0 or higher from Microsoft. Prolific driver doesn't work with Win10 x64 without it.. The alternative is to buy a "Red" programming cable that includes the driver installed within the cable itself. I have the same trouble. Hi folks. I just picked up a new UV5R. I'm trying to clone my slightly older 5R. Chirp and the cable work find on both radios, but because of the slightly different firmware, I can't write the contents of the older radio to the new one. Is there a workaround?